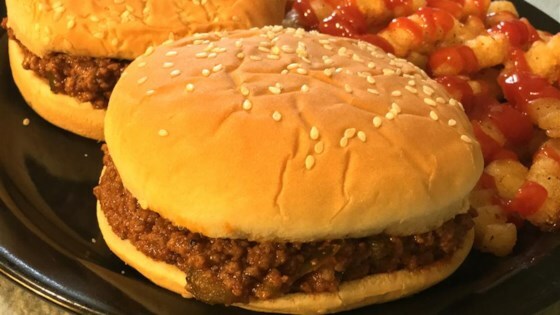 "Despite the name of this iconic retro dish, the secret to a great sloppy joe is a thick, rich, almost dry consistency, which allows the sandwich to be eaten with your hands. Serve on hamburger buns." Stir in garlic and green bell pepper; cook and stir until softened, 2 to 3 minutes. Add 1 cup water and stir, scraping the pan to dissolve any brown flavor bits from the bottom of the skillet. Mix in ketchup, Worcestershire sauce, brown sugar, Dijon mustard, salt, and black pepper. Add 1 more cup water and return mixture to a simmer. Reduce heat to low and simmer, stirring occasionally, until the liquid has evaporated and the mixture is thick, about 40 minutes. Season with salt , black pepper, and cayenne pepper to taste. No more Manwich for my family! My family loved this recipie--I just added a splash of cider vinegar for an extra tang! Perfect. Thanks Chef John-Cant wait to try more of your recipies. Too sweet for my liking...I had to add more worcestire and a bunch of hot sauce to tone down the sweetness. Good for a starter recipe. Im only 13 and i made it great and it was easy.